I have problem with charging my acu. In electro mechanical workshop we checked alternator and it works good (charging 14,5 ) . After instaling it in my ford nothing . On acu is 11,5 V.
Any ideas where should i look ? fuses are ok. everything in car is working (all lights, radio, all indicators, choke, etc.) Engine starts on first kick. Your truck should have the 2G alternator, which was new to the Bullnose trucks in '86. 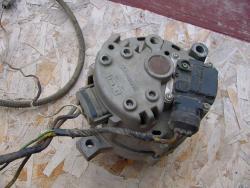 If so you won't have a regulator, which is a square box, on the fender behind the starter relay. 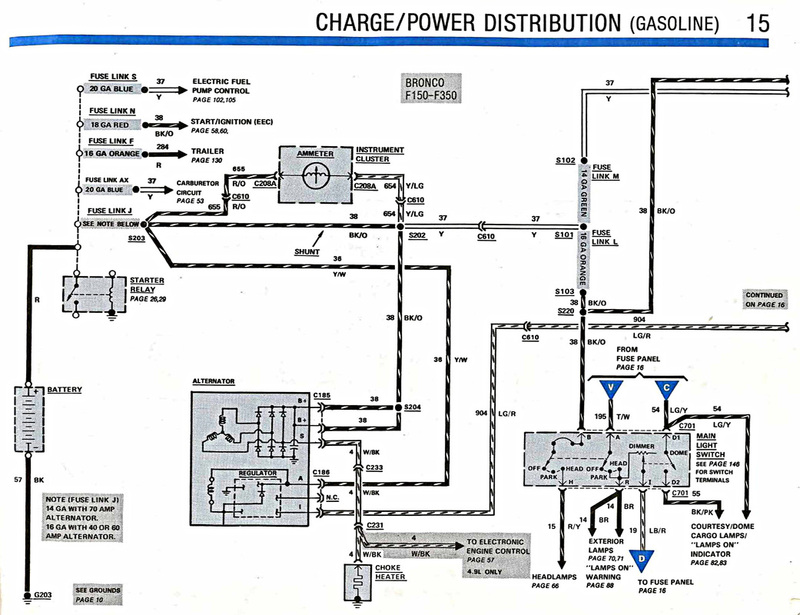 And it will be wired as shown below, but which comes from here: Electrical/EVTM/1986 EVTM/Charge & Power Distribution - Gasoline Engines. So, if you've tested the alternator off the truck and proven it is good, then the problem has to be one of two things. First, check that with the key in Run that you have battery voltage on the light green/red wire. That provides the initial excitation to the alternator, and w/o it the alternator won't charge. Second, ensure that all of the connections are good, including that the alternator is grounded. We are fighting with alternator. there is "+" is on "I " not on "S" as it should (regulator). the conector has A S I - and wires are only on A and S.
So, if we conect "I" on regulator with green wire on conector( which is now conected with S), alternator should cherge acu. Are there any dangers when we do this way? Inducing power on alternator is 4 A and after start goes to almost 0. Jarek - Please don't take this the wrong way as your English is FAR better than my Polish. But, I'm not sure I understand what you said and/or are asking. I: This is the excitation to the alternator. There has to be some voltage on it in order for the alternator to function. And the diagram shows that the wire on it (light green/red) should have battery voltage when the ignition switch is in the Run position. 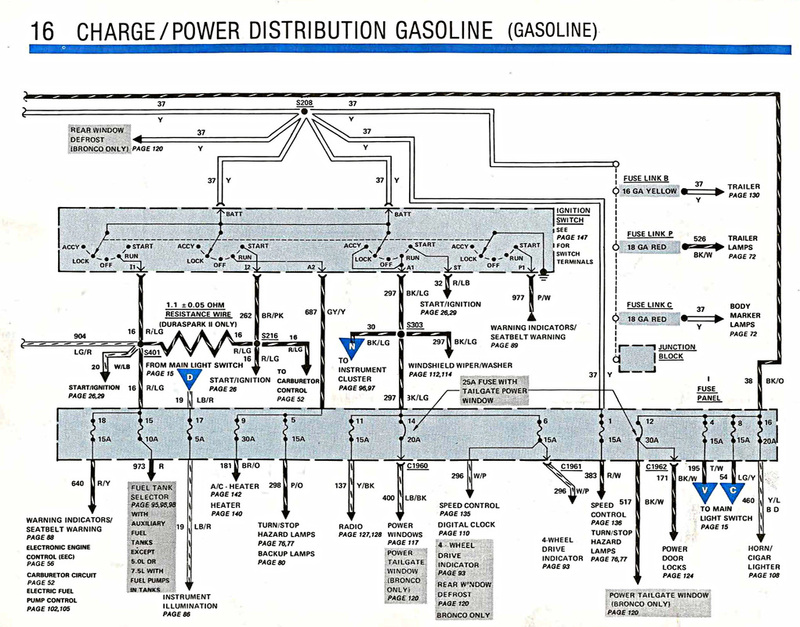 S: This is the stator output of the alternator, and is only used for the choke's heater and to tell the computer that the engine is running - on the 4.9L engine, only. So the light green/red wire really needs to go to I. There are 2 conectors going to alternator. one is with 3 wires - this is OK.
And on S there is no "power". It is on I. So we have to take off wire from S and put it in I .
I do not know how it works earlier? because i bought car as it was. No, S goes to S; I goes to the ignition switch via the dash indicator light. 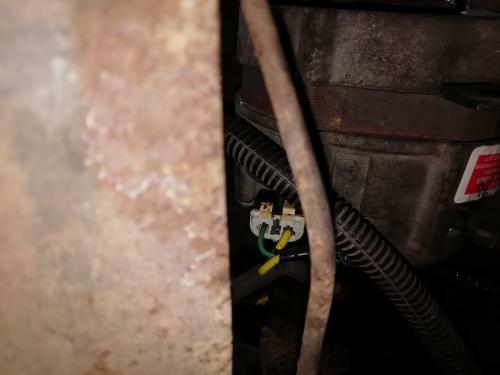 Both connectors have 3 wires: the big connector that goes through the Aluminum casting has 2 Bk/Or wires (Battery +) and a Wh/Bk (Stator); the smaller connector on the external voltage regulator has the other end of the Wh/Bk "S" wire, and the LG/R "I" (Indicator) wire, and a Yellow "A" wire that splices into the Bk/Or wires near the starter relay. Do not connect S to I. Walk softly and carry a BIG SIX!!! So, what we should do ? I do not have dash indicator light. There is no white - conector has "dead end" on this place. What i want to do is take LG/R wire and conect it to "I" terminal on smaller conector. I'd get either a replacement terminal for the middle of the small connector, or another small connector with all 3 wires, and connect S to S. But the best solution is to toss that 2G alternator & its harness, and install a 130-Amp 3G with its harness. Gary has an article here that explains how in more detail.